Secluded, private and exclusive, Villa Karishma is a total hideaway where the chances of anyone stumbling across you are remote, despite it being just 20 minutes from chic Seminyak. This staffed, 6-bedroomed property in sleepy Umalas comes with home theatre, large swimming pool, in-room mod-cons, gourmet kitchen and a bar. 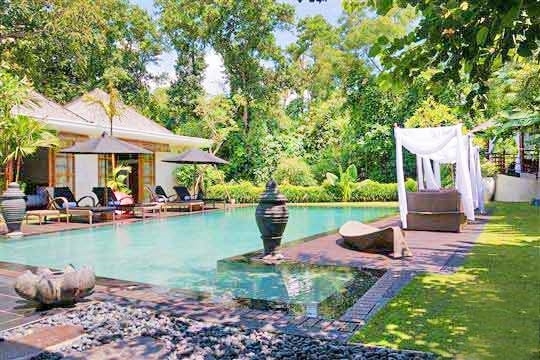 Nestled beside a river embankment in the tourist-thin village of Umalas just a few kilometres north of Seminyak, Villa Karishma is an exclusive retreat where privacy for discerning groups or a couple of families is guaranteed. Reached down a narrow lane flanked by moss-encrusted walls, your arrival at the villa quite literally transports you into another world as vivid memories of a cosmopolitan lifestyle soon dissolve into a vision of luxury, peace and calm. Bedrooms designed to comfort, delight and pamper the overworked are presented on either side of a huge living room that stretches the entire width of the property and opens widely onto to a contemplative pond garden and an expansive swimming pool terrace dotted with shaded loungers and enhanced by a natural wooded backdrop. Here you can relax beside the aqua blue swimming pool listening as the water trickles past in the river and watching as the birds flit about the feathery stands of towering bamboo rising up from the wooded embankment. From the raised balé beside the river, you can kick back with a book to enjoy a little peace and quiet away from the rest of the group as the fan whirrs gratefully overhead. The six bedrooms are equally-sized (if you don’t include the gigantic master suite) and arranged in twos, giving each pair plenty of privacy. 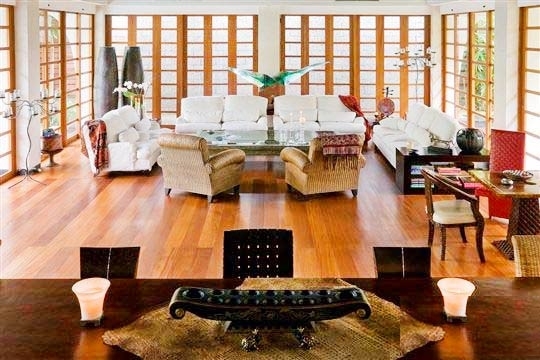 For movie buffs this villa is an inspired choice since each bedroom is equipped with its own TV and DVD player with surround sound. 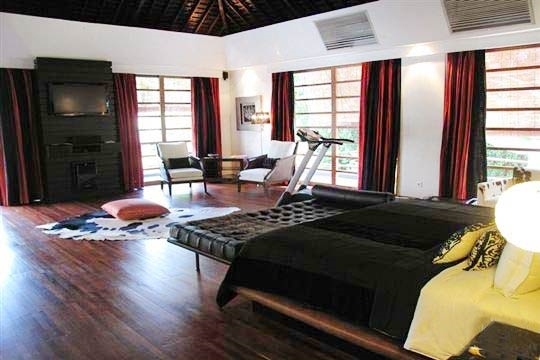 One of the bedrooms can also be converted into a cinema as it has its own movie projector. 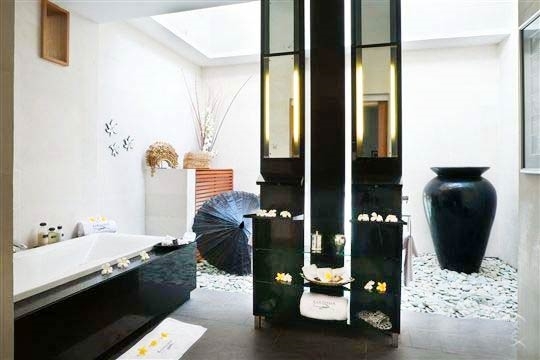 iPods can be connected to the main sound system in the living room which is also wired to speakers beside the swimming pool to create an ambiance entirely dependent upon your mood. The shiny granite-topped bar is an ideal place for social gatherings whilst the excellent kitchen is geared for the chef to create gourmet delights (at cost price). Karishma’s staff team, while small in number, will assist you with anything from unpacking your belongings and ordering a taxi to pouring your favourite drink. The massive living room, complete with bar, is the perfect social hub. 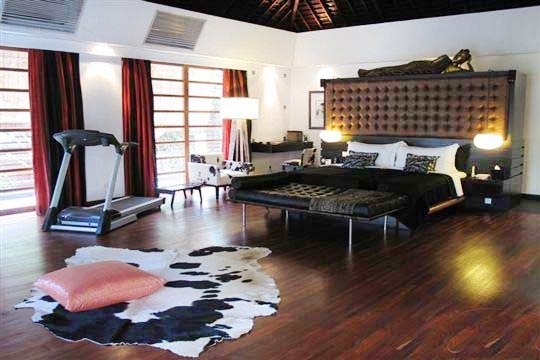 Villa Karishma is certainly a very large villa that offers luxury and privacy. Our first impressions were that the high walls to either side of the villa made it feel a little hemmed in, but after a while this enclosure actually became quite comforting, and the views across the pool remain open towards the river and its wooded embankment. 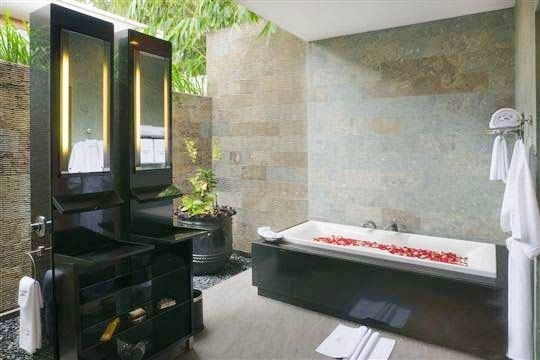 Although the master suite is without doubt the largest and most indulgent of the six bedrooms, the others are all of a similar size and so would be good for equitable sharing. A big selection of DVDs should suit everybody’s tastes – and can be enjoyed in the privacy of your own bedroom. We found the staff team, and in particular the butler, to be friendly and responsive to our requirements; they were very experienced and although perhaps few in number for a property of this size (only five full time), more can be called upon if the villa is fully occupied. The kitchen is very well-equipped and although presided over by a good chef who creates meals at cost price (plus 15% service charge), the staff did mention that guests are welcome to use it too, and that they are happy to help prepare and wash up. 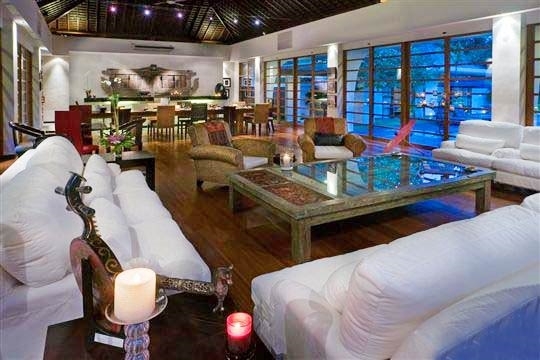 That said, we felt that Villa Karishma really is a place for escapism and pampering; the massive living room, complete with bar, is the perfect social hub. As well as a security guard, the villa also has 24 hour CCTV with cameras in the kitchen. There are no shopping or dining facilities within walking distance of the villa so if you wish to venture out a car is necessary. Alternatively, the staff can easily call for a taxi. 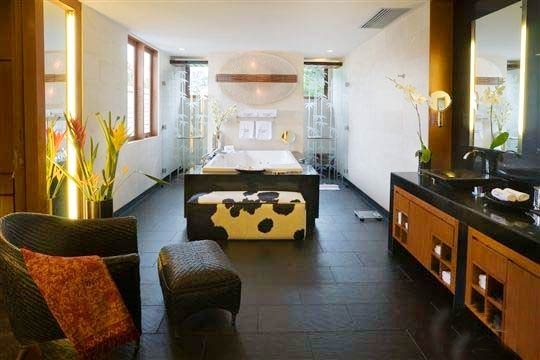 This villa is very private so it’s perfect for discerning travellers to enjoy some peace and quiet away from the crowds. Having a home cinema, a bar and bedrooms each with their own TVs , DVD players and surround sound, provides guests with plenty of entertainment options and makes up for the villa’s slightly out-of-the-way location. 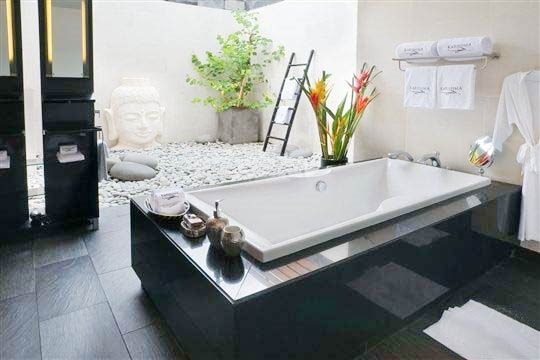 We had trouble with the wash basins in the bathrooms (except the master bathroom) as they were far too shallow to hold enough water: they might look good but we found them a little impractical . During our visit (March 2010) a condominium was being built next door so there was lots of construction noise towards the rear that did affect the enjoyment of our stay. That said, building work was nearing completion and should therefore not cause much of a distraction in a few months’ time. Villa Karishma is flanked by a villa on one side and a condominium complex still in the making on the other. On the far side of the verdant riverbank opposite Karishma is an international school whose red tiled roof peeping out from behind the curtain of leaves is the only evidence of it that you’ll see. The villa is reached down a long passageway from the main road in Umalas and is only one kilometre from the famous Umalas Equestrian Centre. The beach at Petitenget is a ten-minute taxi ride away whilst Seminyak, where the bulk of the region’s shops and restaurants are located, is four kilometres from the villa. Here you will also find pharmacies, banks, money-changing facilities and supermarkets. 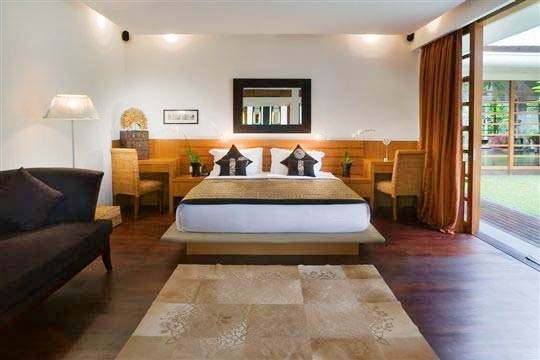 Villa Karishma is presented in an F-shape where two bedrooms and a living area form the two horizontal prongs of the letter, with the space in between occupied by a pond planted with a row of royal palms. Two further ground floor bedrooms and the kitchen form the vertical stroke of the ‘F’. The living room is a huge open-plan, air conditioned space with expansive squashy sofas at one end and a dining table for 12 and black granite-topped bar at the other. Unusually, there are four different styles of chair around the dining table which gives even the practical furnishings an arty edge. Tall sliding doors open on three sides to provide access from the rear garden and the pool. 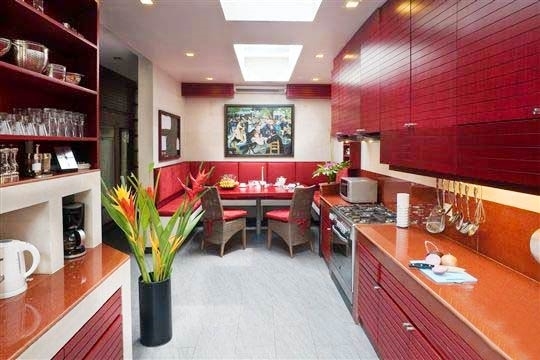 Behind the living area is the kitchen, whose contemporary cupboards blush red and whose corner breakfast table seating is cushioned for comfort. The kitchen is fully equipped with a large oven, hob, coffee machine, microwave, big fridge, freezer and also a fully-stocked wine chiller. 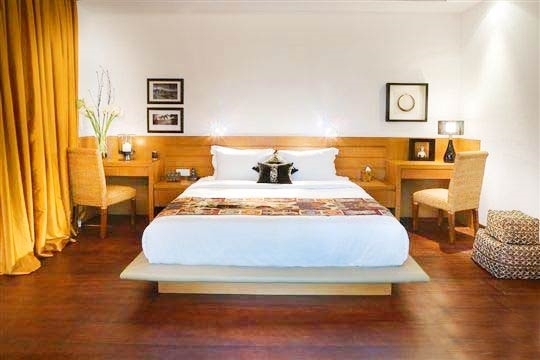 Aside from the master bedroom, each of the five florally-named guestrooms is similarly sized and, although different in colour accent, decor and location, shares the same amenities; air conditioning, double beds, writing desk and built-in wardrobes with LCD TV, DVD player with surround sound, and mini fridges. 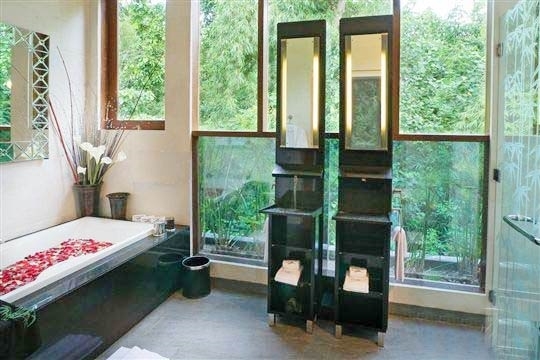 Bathrooms vary in size slightly but all have rain showers, tubs and twin vanity units. One of the bedrooms, Garance, features a projector that plays movies onto the end wall. Four of the six bedrooms are on the ground floor: two open onto the pool terrace and two towards the rear of the house. Two upper storey bedrooms (including the master) are accessed via a staircase leading up from between the rear ground floor bedrooms and the living area. 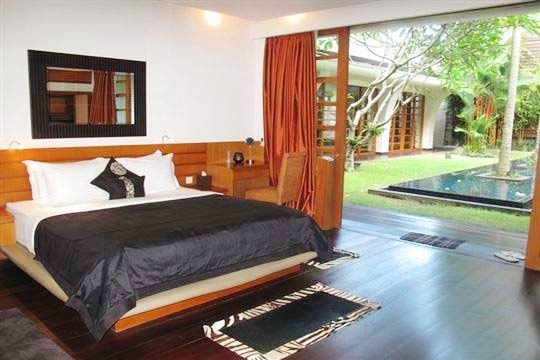 The air conditioned master bedroom is an indulgent living space with sliding doors opening onto a garden-view balcony. A high timber roof creates grandeur whilst the rich black-and-red colour scheme and quilted leather furnishings hint at seduction. 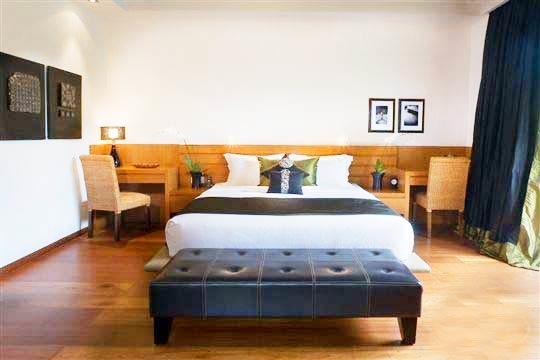 Furnishings and facilities include a king-sized bed, a wall-mounted LCD TV with DVD player and surround sound, built-in cupboards, a writing desk with WiFi connection, a treadmill and a sitting area. The ensuite bathroom is also air conditioned and has a double jacuzzi tub, twin sinks, shower and a spacious walk-in closet. 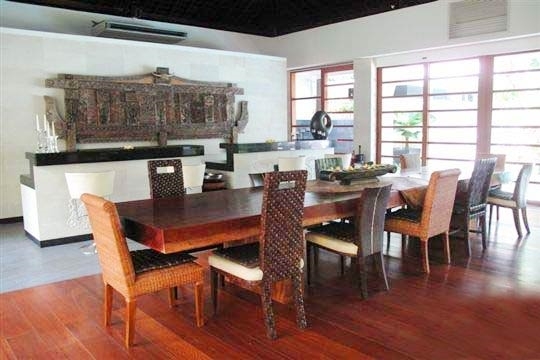 The managing agent of the villa charges a USD150.00 fee for each change after a booking has been confirmed. 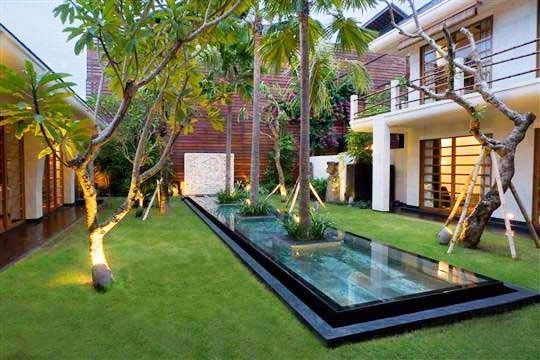 6 bedroom villa located in Umalas-Kerobokan, Bali. Ideal for Beach in ten, Bring the relatives, Executive escape, Kid friendly, Fair share for groups, Sensible for seniors.